“Whiskey stones” have been a popular item for the past couple of years. They cool your drink without watering it down, which is true, to a small extent. The problem is that stone is much, much worse at cooling your drink than ice. Let’s look at the math. The specific heat of water is 1 cal/g, which means it takes 1 calorie of heat to raise the temperature of 1 gram of water by 1 degree Celsius. The specific heat of soapstone (as in these whiskey stones) is 4.1 cal/g. So, soapstone can cool your drink with one-fourth the equivalent mass of liquid water. However, the process of melting one gram of ice into one gram of water at the same temperature takes 79.7 cal/g. Which means one gram of ice melting into one gram of water at zero Celsius is about 19 times more powerful than one gram of cold soapstone at zero Celsius, in terms of cooling down your bourbon. The melting process, not the heat capacity of water, is what makes ice cool drinks so efficiently. 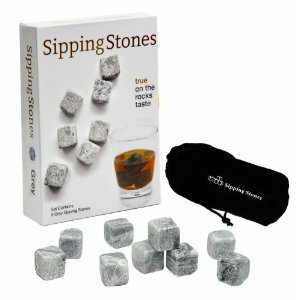 That’s probably why most of the customer reviews for most of the whiskey stones I found online complained that they don’t keep your drink cold.